What Is Health: The Skinny on Healthy Eating! "May I always remember how good it feels to feel great?" May I follow my diet? May I have grace for today? May I eat more vegetables? May I listen more and talk less? May I stop binge eating? May I fit into my skinny jeans by June? May I have a glass of wine at night? May I stress less and eat more chocolate? Following a diet or regime for months can become monotonous and tedious; especially when one hasn't achieved the results they wanted by the anticipated time. Nevertheless, the goal is still attainable. v Skipping meals. Ask yourself if you diet by day and binge by night. v Are you "grazing" yourself fat? It is easy to eat 600 calories of popcorn, pretzels or cereal without realizing it. 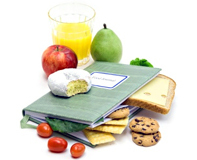 Eat only pre-portioned snacks. v Am I being consistent? Consistency will help you meet your goal sooner. v Ignoring "Serving Size" on the Nutrition Facts panel; i.e., one serving of corn chips is 10 chips, not the whole bag! v Snacking on bowls of nuts and dried fruits. While both are healthy and a good source of nutrients, they can be high in calories. Stick to one portion. v Eating pasta and thinking it is "light." A serving of pasta is 1 cup, not the 2-3 cups most people eat, or restaurants serve. v Know that not all energy bars and smoothies are nutritious or low-calorie. Read labels and choose the most nutrient dense option. v Are you drinking enough water? It is common to begin a weight loss regime by drinking enough water, only to reduce the amount over time. v Do you allow yourself an occasional treat? Deprivation doesn't work. Allowing yourself treats every so often deters excessive eating.